To make up for its failure in attracting private investment, the Indian Railways is gearing up for a grand entry into the private-public partnership (PPP) space with two locomotive factory projects worth Rs 32,000 crore set to take off by December. Multinational company GE, Chinese locomotive firm CSR and global leader in locomotives EMD have evinced interest in setting up diesel locomotive factories, while five companies - GE, CSR, Bombardier, Alstom and Siemens - have taken part in pre-bid meetings for an electric locomotive factory. The railways plans to shortlist companies by July-end after receiving the requests for qualification. Arunendra Kumar, chairman, Railway Board, told Business Standard: "We received some queries after which a pre-bid meeting was held last month. We hope to award the projects by December." In May, the Cabinet had approved bidding for the projects afresh for an electric locomotive factory at Madhepura and a diesel locomotive factory at Marhowra, both in Bihar. The two projects were announced in 2006 by the then chief minister Lalu Prasad. These were to be set up in partnership with private players, with the railways holding 26 per cent stake in each. However, the projects never took off, despite bidding being conducted several times. Kumar said PPP in railways would be happening for the first time in a massive scale with these two factories. "It is a novel concept. For us, it will be a success in a sector where we have never ventured before," he said. After the shortlisting, bid documents comprising requests for proposal (RFP) would be forwarded for inter-ministerial discussions. The selected private partners would manufacture locomotives and supply these under a graded annual scale. Over a 10-year period, the factories would provide the railways with 800 electric locomotives of 12,000 horsepower (hp) each and a mix of 1,000 diesel locomotives of 4,500 and 6,000 hp with high level performance guarantees, similar to international practices. In RFPs, the companies would quote a price for each locomotive, along with maintenance and training clauses, in the contract. Another major project to be undertaken on PPP basis would be the elevated 62.28-km rail corridor in Mumbai that will link Oval Maidan and Virar. Kumar said although work on the corridor should also begin shortly, setting up the two factories through PPP should not be a problem since there were no land issues for both the factories. The Mumbai elevated project, estimated at Rs 21,000 crore, has seen shortlisting of six companies. 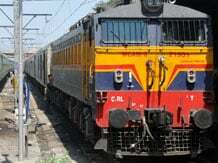 The railways are waiting for signing the state support agreement with the Maharashtra government. "The agreement is important since revenue generation for the project would also be through land use for which the state needs to modify floor space index (FSI)," said Kumar. The state government is carrying out site by site checks along the alignment. Twenty-six stations are proposed on the corridor, out of which five stations would be underground, 19 elevated and two at the ground level. It would be built on design, build, finance, operate and transfer basis. The Western Railway and the state government are discussing issues relating to land acquisition, shifting of underground utilities and commercial use of land between Western Railway and state government. A detailed financial model is yet to be submitted, though Western Railway has sought commercial exploitation of 130,000 sq m along the route to fund the project. The Maharashtra government had given an in-principle nod to the project on April 9.